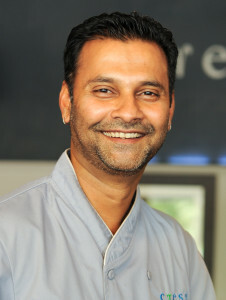 Chef Hari Pulapaka, Chef and co-owner of Cress, in DeLand, Florida, has been serious about responsible buying decisions since he opened his restaurant in August of 2008. Last week we sat down with Chef Pulapaka to discuss his approach to sustainability in the kitchen. What was your intro to sustainability in the kitchen? Growing up in Mumbai (formerly, Bombay), India, I was used to procuring seasonal ingredients from the neighborhood farmers markets or the grocer who delivered the ingredients to our home (many of which still do today). These ingredients were mostly sustainable and native to the region. When did you first start to think about sustainable practices in the kitchen and how did you start? When my wife Jenneffer and I decided to open our restaurant Cress about 5 years ago, I naturally sought out sources of local and sustainable produce, seafood, and meat proteins. We have a weekly farmer’s market in our area, and I’ve gotten to know some of the farmers very well over the years. Sometimes I go to the farms to pick up the produce myself. We’ve also scheduled numerous dinners at the farms, one of which took place in April of this past year. What size restaurant are you operating? Cress seats 38 guests in the dining room and 15 guests on the “Cress Patio,” our al fresco dining space. Cress is an independent (my wife and I own and operate it) restaurant that specializes in blending local, seasonal, and artisanal ingredients with globally inspired dishes. Of course, we recycle as much as possible, minimize our energy consumption, and use all food trimmings for house made stocks. Jenneffer and I are also exploring the possibility of partnering with Stetson University and the merchants of Mainstreet DeLand Association to use normally discarded food waste to make fertilizer or feed for local farmers. This project is still nascent in its development, but we are greatly inspired to continue the conversation and are serious about putting it into practice. I recently attended the James Beard Foundation Boot Camp for Policy and Action in Louisville and came away with a plethora of ideas, all of which require time and dedicated focus. Additionally, I am working closely with some national leaders on matters related to sustainability: Michel Nishan, (JBF Winner, President & CEO of Wholesome Wave), Katherine Miller (Director, Chef Action Network), Eric Kessler (Founder, Arabella Advisors), Kristopher Moon (Director of Charitable Giving, The James Beard Foundation), Maria Hines (JBF Winner), and Andrea Reusing (JBF Winner). At the end of the day, we make choices that are in line with our restaurant’s mission. I wouldn’t describe this as a challenge but rather a logistical constraint: we have many ideas, but sometimes it is difficult to find the time to get the ball rolling on a specific venture. In addition to being a full-time and active professional chef, I teach Mathematics full-time at Stetson University, and my wife runs a private medical practice full-time along with managing the restaurant and serving as its Wine Director. I’m best known for my seafood cookery but I can make one heck of a pasta dish. I am seeking new connections and ideas from experts and colleagues around the country so that I can be an active and significant leader in my region (Central Florida) on matters related to the sustainability and health our region’s food system.